A disabled father of two says the Village of Union took away his only means of getting around town. Now his family is fighting back and starting a social media campaign to change a village ordinance. Dale Carr lost the use of his legs 26 years ago in a factory accident. He broke his neck after his left arm got caught in a machine. He underwent a spinal repair and has lived his life in a wheelchair ever since. Several years after his accident, Carr improved his ability to transport himself over longer distances. 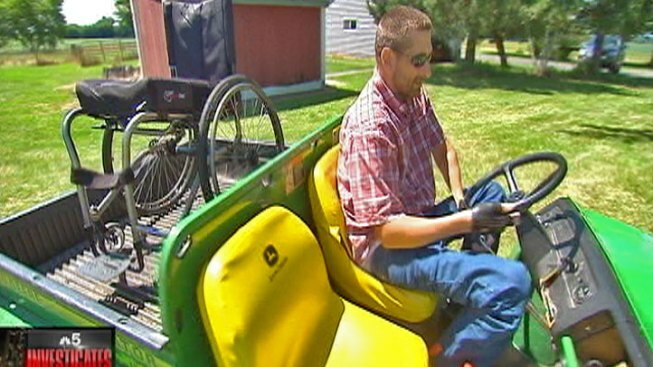 He purchased a John Deere Gator utility vehicle and often used his customized UTV to drive himself about a mile to downtown Union, a village of about 580 people, according to the last Census data. “It just made things easier,” Carr said. It’s how Carr ran errands and went to meetings for 15 years without counting on his family members for rides. "I would pass county officers. I would pass village police officers and they would all wave," Carr recalled. But Carr said a Union police officer pulled him over in late 2012 and explained he could no longer drive the Gator on village roads. Carr sought answers from village leaders. "The reason that they told me no was, I was an issue of public safety," Carr said. Carr’s wife, Bonnie, said they were also told some people were complaining. "When we asked for names, they couldn’t come up with the names," she said. Carr now relies on family members to help him run errands around town. He said it is difficult to move his wheelchair around downtown Union because of "architectural barriers and concrete problems." Illinois state law allows municipalities to permit non-highway vehicles to drive on roads with posted speed limits of 30 miles-per-hour or less if it’s determined not to pose a threat to safety. The state does not keep statistics on the number of local governments that allow the use of non-highway vehicles on roads, but a golf cart distributor near Springfield estimates between 200 and 300 towns in Illinois allow it. Carr notified the village board about the law. However, the village sent Carr a letter stating that while it had been investigating and considering the advisability of allowing non-highway vehicles on village streets, it would not allow it. Carr and his family said they will continue to push for an ordinance allowing for the use of non-highway vehicles in Union. A Facebook campaign has started to help raise awareness. "There’s enough room where he doesn’t have to run on the actual highway with it," Union resident Doug Noble said. "There’s plenty of room. I don’t see any harm in it." The Carrs are also considering their legal options. "I’m not going to quit until I’m done," said Bonnie Carr. The village president did not return repeated requests for comment. The attorney representing Union also declined to comment.